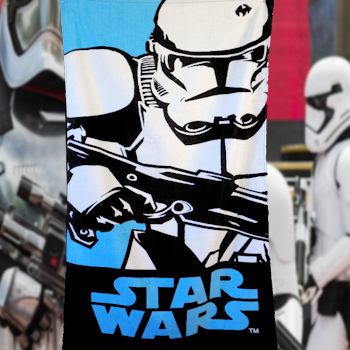 Star Wars Clone Trooper beach towel that can be personalised with and embroidered name if you choose. Star Wars Clone Trooper beach towel that can be personalised with and embroidered name if you choose. Made from 100% lightweight Cotton, 120 by 60cm approx. Image may differ from that pictured A fantastic kids towel for bathtime, swimming or to lay on the beach. Amys Gifts can personalise this towel for a small additional charge. Just choose the yes option and fill in what name you would like embroidered. We use the largest lettering for the length of the name we can. we use a coordinating thread colour and position the name so it will not obstruct the main picture on the towel (for this beano towel the name is put towards the bottom corner). A towel makes a great gift with that added unique touch - is also handy for swimming or the school to ensure towels do not get mixed up!